We are going to Oregon to see my sister in almost 10 days and I wanted to take a little something for my little niece Ruby. Fortunately, my friend Amy had an awesome pdf sewing pattern that I bought on her etsy shop. You need 3 fat quarters and roughly 3 hours to complete it. Just whipped it up this morning. It was supper easy and the instructions are written very well. I think I may have messed up the armhole curve because I wasn’t paying attention, doing the opposite of what the instructions said. I think it will still work. Now I just have to wait until our trip to see if it fits( I still have to sew in the buttons because I’m waiting). If it’s too big, I can see her wearing this in the winter with a long sleeve shirt underneath and cute little leggings. 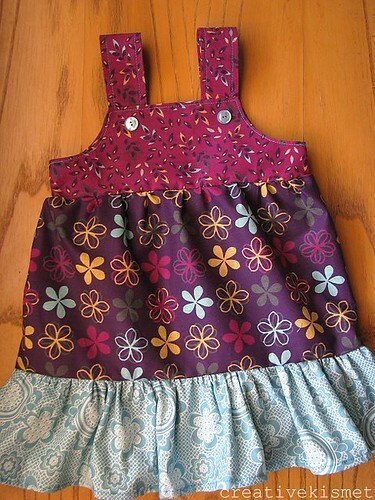 This entry was posted in Clothing, Sewing and tagged 333 dresss, clothes, kids dress, Sewing. Bookmark the permalink. First, thanks for the mention! Second I wanted to let you know Molly still wears that original dress this summer as a longer top with shorts and she’s a full on 3T these days. I’m getting ready to size the pattern up again to make her a new dress and size it down to tiny for my baby niece too. I think those armholes look fine to me, great job! Love the fabrics you used too.